Description: Those of us who always wished that the #952 Play Family House or #990 Play Family A-Frame had a swimming pool added on got our wish in 1986 with the #2526 Swimming Pool. This set used some carry-over pieces from other sets, such as the lawn chairs (last used in 1980-1984's #992 Play Family Car and Camper), the 1-step slide (last used in 1978-1979 and 1989's #929 Play Family Nursery School), the BBQ grill (last used in 1979-1982 & 1985's #260 Dollhouse Patio Set), and the life preserver (last used in 1979-1980's #932 Play Family Ferry Boat). While the life preserver has been used before in other Little People sets, this is the first time it was colored white...it was always yellow before. The white life preserver later showed up in 1989-1990's #2524 Little People Cruise Boat. The lawn chairs that were previously used were always yellow. This is the only Little People set that uses an orange lounge chair. The lifeguard chair and diving board are exclusive pieces to this set...both were available in green and in yellow. The umbrella table is also exclusive to this set, although the idea is not original (the last used umbrella table was in 1973-1977's #997 Play Family Village.) The difference between the umbrella table used in this set, and those used in previous sets is that the table has round legs that fits into a hole in the swimming pool base. B2526A - Tan swimming pool base with a blue recessed area for the pool "water". The tan base has a wood-simulated deck with 1 step on the side, and a molded-in 3-seat bench. Overall size: 8-3/4" wide, 8-7/8" deep, and 2" tall. *See "Variations" below. FPT155 - Tall green plastic lifeguard chair with a "hook" on the backside that holds a life preserver. The chair has a high squared base with molded legs on the sides. The top has a round recessed seat and the back has a high squared backrest. FPT8534 - Yellow diving board base with a white springy "diving board". FPT607 - White U-shaped life preserver / life vest (fits around the neck of Original Little People figures). FPT130 - Stand-up style black plastic grill that has a hinged lid, bright metal cooking grate inside, and it sits on a pole atop a square base. Size: 1-1/8" wide, 1-1/8" long, 2-1/4" tall. *See "Variations" below. FPT158 - Orange plastic slatted "beach" lounge chair with short arm rests on the sides and a raised backrest (2 slats high). The bottom of the chair has a THIN rectangular mold WITHOUT the reinforcement rib on inner edge, click here for an example. Both center sides of the frame have a molded circle and half of the circle sticks out from the inner edge of the frame. *See "Variations" below. FPT159 - Bright Yellow plastic slatted "beach" lounge chair with short arm rests on the sides and a raised backrest (2 slats high). The bottom of the chair has a THIN rectangular mold WITHOUT the reinforcement rib on inner edge, click here for an example. Both center sides of the frame have a molded circle and half of the circle sticks out from the inner edge of the frame. Click here to see the difference between bright yellow and dull yellow. FPT215 - Yellow umbrella table with a small round bottom (fits in pool base), and an orange umbrella top held up via spring. *See "Variations" below. CIPP - Green body boy with a molded black hair. FEPP - Blue body girl with a blonde sculpted bob. B2526A - Tan swimming pool base with a blue recessed area for the pool "water". The tan base has a wood-simulated deck with 1 step on the side, and a molded-in 2-seat bench with an area between the 2 seats to place an accessory umbrella table. Overall size: 8-3/4" wide, 8-7/8" deep, and 2" tall. *See "Variations" below. FPT156 - Tall yellow plastic lifeguard chair with a "hook" on the backside that holds a life preserver. The chair has a high squared base with molded legs on the sides. The top has a round recessed seat and the back has a high squared backrest. FPT8537 - Lime Green diving board base with a white springy "diving board". FPT21 - Orange 2-step slide. FPT545 - Lime Green umbrella table with a small round bottom (fits in pool base), and a yellow umbrella top held up via spring. *See "Variations" below. B2526B - Green swimming pool base with a blue recessed area for the pool "water". The green base has a wood-simulated deck with 1 step on the side, and a molded-in 2-seat bench with an area between the 2 seats to place an accessory umbrella table. Overall size: 8-3/4" wide, 8-7/8" deep, and 2" tall. FPT720 - Stand-up style grey plastic grill that has a hinged lid, bright metal cooking grate inside, and it sits on a pole atop a square base. Size: 1-1/8" wide, 1-1/8" long, 2-1/4" tall. FPT784 - Orange plastic slatted "beach" lounge chair with short arm rests on the sides and a raised backrest (2 slats high). The bottom of the chair has a WIDE rectangular mold WITH a reinforcement rib on inner edge, click here for an example. FPT214 - Yellow umbrella table with a small round bottom (fits in pool base), and a green umbrella top held up via spring. *See "Variations" below. 1986 - This set was sold in a 9" long, 9-1/16" high, 9-11/16" deep box. 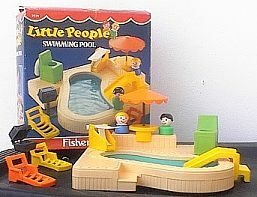 1987-1989 - This set was sold in a 9" long, 9-9/16" high, 4-1/2" deep box. 1987-1989 - FP2526SET1988 - Complete Set w/ Box - WFL: 07-AE-43-6-A. The BBQ grill used in this set was also used in 1979-1982 & 1985's #260 Dollhouse Patio Set, and was also used in 1983 until 1984 in #272 Lounge & Grill. The white life preserver used in this set was later used in 1989-1990's #2524 Little People Cruise Boat.